Pop. 2,555. In Ashmore T., Thunder Bay Dist. on the CNR and Hwy 584, 6 km N of Hwy 11,270 km NE of Thunder Bay. Pop. 125. In Thunder Bay Dist. on Hwy 11, 44 km W of Geraldton. Pop. 705. In Kenora Dist. on the N. shore of Eabamet L., 350 km. by air NE of Thunder Bay. The reserve is home of the Fort Hope Indian band. Pop. 300. In Thunder Bay Dist. 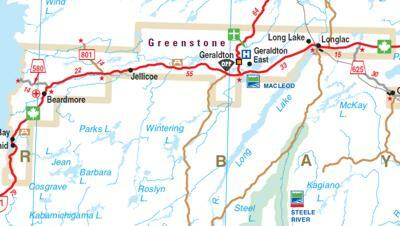 2 km NW of the N end of Long L., and 2 km W of the Town of Long Lac, 215 km W of Hearst and 294 km NE of Thunder Bay. Long Lake Band #58 owns the reserve. Pop. 1,769. In Oakes T., Thunder Bay Dist. at the N end of Long L. and Hwy II, 213 km W of Hearst and 296 km NE of Thunder Bay. In Bickneee T., Cochrane Dist. on the Pagwachuan R 85 kms by air NW of Hearst. First map reference 1956. Pop. 614. In Nakina T., Thunder Bay Dist., on Hwy 584, 66 km. N of Geraldton. In 1913 Nakina was a construction base for National Transcontinental Railway workers.